Our prayers are with all those injured in the Airlink flight 8911 accident in Durban, which brings it closer to home that we're all on this planet for a finite amount of time and that while flying is a very safe way of travelling, it is not without incident. Thank God there were no passengers on the plane. And the moral of the story - don't fly on flights with codes ending in 911! As Freddie Mercury once said, the show must go on, and congratulations to Kulula on their R389 flight price from Cape Town to Durban, which is part of the Kulula 8th birthday special (and happy birthday to them). Kulula's R389 is cheaper than taking a Greyhound, Translux, Citiliner or City to City bus! And well done to 1time - not far behind on R399, and to British Airways on their lowest price ever on the route. But I'm getting a little worried about Mango Airlines - even more expensive than British Airways South Africa (a full service carrier). ** record low flight price for BA British Airways from Cape Town to Durban (previous low was the R533 BA price in our previous Cape Town-Durban survey). By the way, if you booked flight MN6313 on the Kulula website (which is the same flight as BA6313) you'd pay R89 more. This is why it pays to always check both the BA and Kulula website, as you never know which is cheapest (see our tips for cheap flights in South Africa). *** Citiliner's highest price ever in our Cape Town to Durban price travel surveys (previous highest Citiliner price was R410 in the 6 Dec 2008 survey. To get an idea of how much flight prices have dropped, last year this time the cheapest flight prices we could find from Cape Town to Durban was some R915 - contrast that to today's cheapest price of R389. Wren went on holiday in Durban. As for many travellers to South Africa, Wren's trip began without his luggage - it arrived from Cape Town a day later (Ed: I'm having flashbacks to my luggage being sent on the wrong flight on my 1time flight to Joburg). 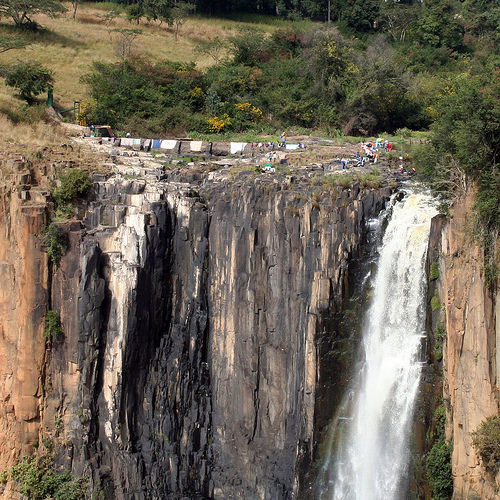 In Durban he took in the dolphins on the Dolphin Coast, the King Shaka Heritage Trail, KwaZulu-Natal's sugar can fields, Ballito, the Valley of 1000 Hills and Howick Falls (Ed: after seeing his photo, I want to go there too) - note the locals doing their washing at the top of the falls! Champagne Sports Resort in KwaZulu-Natal (also advertised in the Sept edition of about Time, 1time Airline's in-flight magazine - see our 1time Cape Town to Johannesburg flight review). Momentum's wellness program, where you get up to 50% off Mango flights. Aquila Private Game Reserve Safari - accommodation, quad bike safaris, day trip safaris and horseback safaris. The Victorian Hotel in Montagu. Prasa's express train service from Pretoria to Johannesburg. It looked like plain white rice with brown saucy lentils on top...but tasted heavenly. Well done to Joggie at Millstone for making the best lentil curry I've ever tasted. If you're in Cape Town and like a rustic environment, Millstone is a short 5 minute detour from the N2 on your way to or from the airport (on the Pinelands turnoff) - if you see the hippies and horses then you're heading in the right direction (ph 021-447-8226).